ActiveMax® Human VEGF165, Tag Free (HPLC-verified) (VE5-H4210) is expressed from human 293 cells (HEK293). It contains AA Ala 27 - Arg 191 (Accession # NP_001165097). The protein has a calculated MW of 19.0 kDa (monomer). As a result of glycosylation, the protein migrates as 24 kDa (monomer) under reducing (R) condition, and 43-50 kDa (homodimer) under non-reducing (NR) condition (SDS-PAGE). 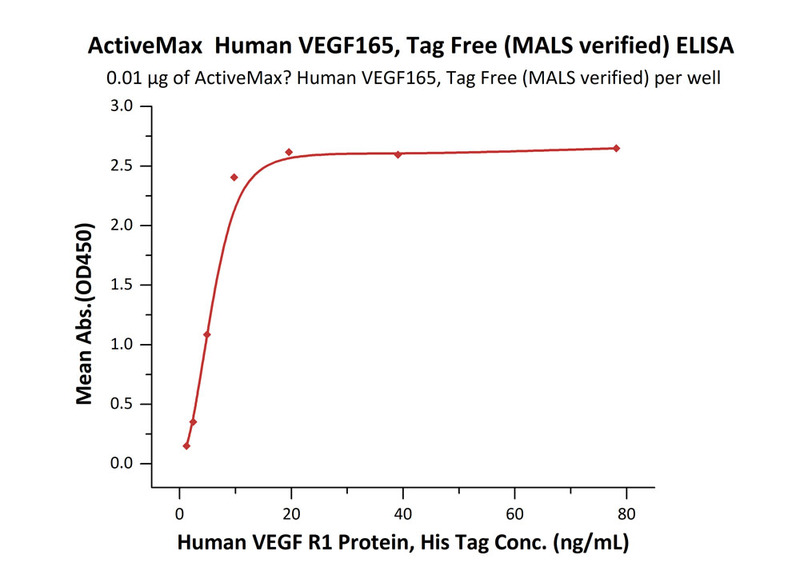 ActiveMax® Human VEGF165, Tag Free (HPLC-verified) on SDS-PAGE under reducing (R) and non-reducing (NR) conditions. The gel was stained overnight with Coomassie Blue. The purity of the protein is greater than 98%. A SEC-HPLC analysis showing 95% of ActiveMax® Human VEGF165, Tag Free (HPLC-verified) (VE5-H4210) present as active homodimers. Immobilized ActiveMax® Human VEGF165, Tag Free (HPLC-verified) (Cat. No. VE5-H4210) at 0.01 μg/mL (100 μL/well) can bind Human VEGF R1, His Tag (Cat. No. VE1-H5220) with a linear range of 4-31 ng/mL (QC tested). 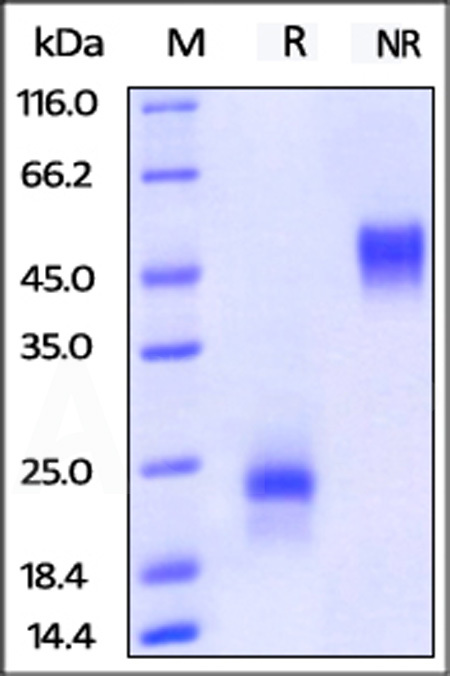 Immobilized ActiveMax® Human VEGF165, Tag Free (HPLC-verified) (Cat. No. VE5-H4210) at 2 μg/mL (100 μL/well) can bind Biotinylated Human VEGF R2, His Tag (Cat. No. KDR-H82E5) with a linear range of 10-156 ng/mL (Routinely tested). Immobilized ActiveMax® Human VEGF165, Tag Free (HPLC-verified) (Cat. No. VE5-H4210) at 2 μg/mL (100 μL/well), can bind pre-mixed increasing concentrations of Bevacizumab and 0.5 μg/mL (100 μL/well) Biotinylated Human VEGF R2, His Tag (Cat. No. KDR-H82E5) with a half maximal inhibitory concentration (IC50) of 0.70 μg/mL (Routinely tested). 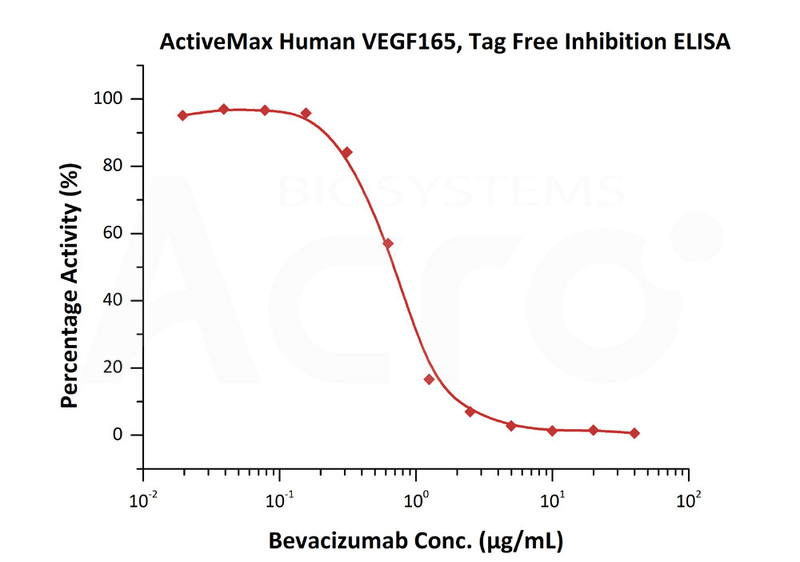 Avastin (Bevacizumab) captured on CM5 chip via ant-human IgG Fc antibodies surface, can bind ActiveMax® Human VEGF165, Tag Free (HPLC-verified) (Cat. No. 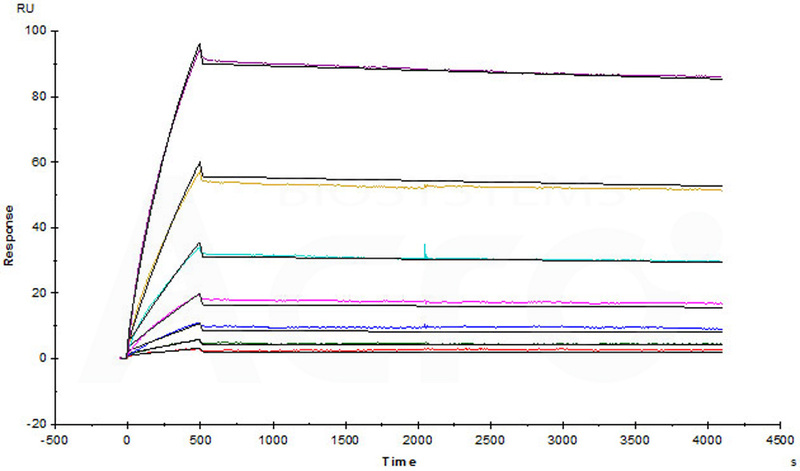 VE5-H4210) with an affinity constant of 0.776 nM as determined in a SPR assay (Biacore T200) (Routinely tested). 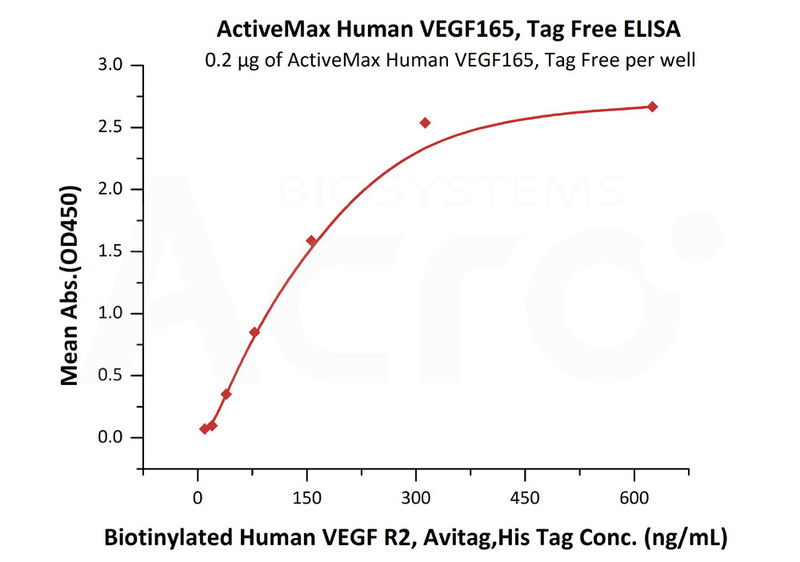 ActiveMax® Human VEGF165, Tag Free (HPLC-verified) (Cat. No. VE5-H4210) stimulates proliferation of human umbilical vein endothelial cells (HUVEC). The ED50 for this effect is 4.216-9.281 ng/ml (Routinely tested). 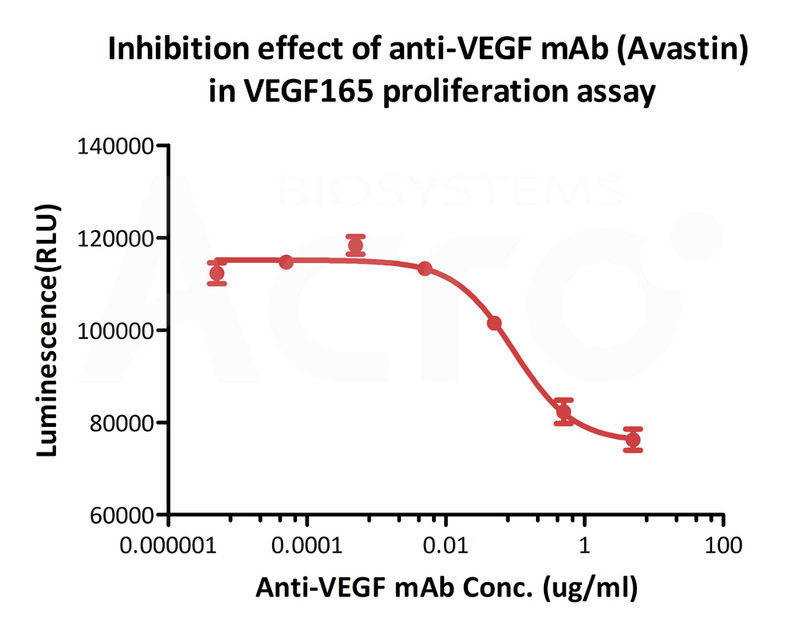 Inhibition assay shows that the proliferation effect of ActiveMax® Human VEGF165, Tag Free (HPLC-verified) (Cat. No. VE5-H4210) is inhibited by increasing concentration of anti-VEGF mAb (Avastin). The concentration of VEGF165 used is 20 ng/ml. The ED50 is 0.065-0.229 μg/mL (Routinely tested). Authors: Keys TG, et al. VEGF165 is the most abundant splice variant of VEGF-A. VEGF165 is produced by a number of cells including endothelial cells, macrophages and T cells. 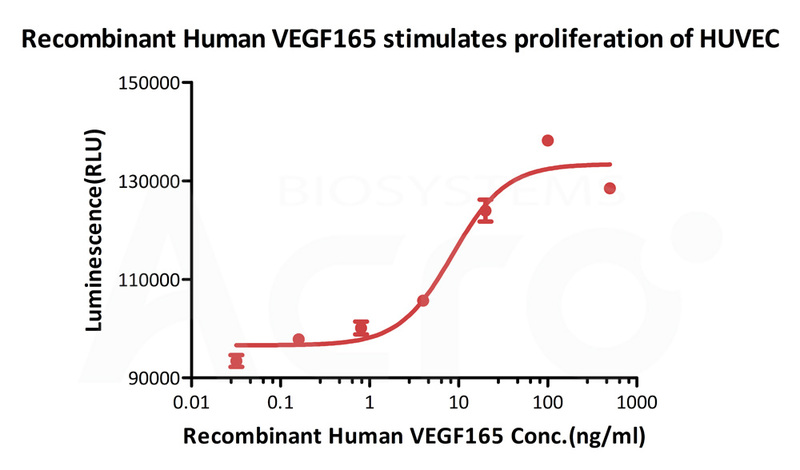 VEGF165 is involved in angiogenesis, vascular endothelial cell survival, growth, migration and vascular permeability. VEGF gene expression is induced by hypoxia, inflammatory cytokines and oncogenes. VEGF165 binds to heparan sulfate and is retained on the cell surface and in the extracellular matrix. VEGF165 binds to the receptor tyrosine kinases, VEGFR1 and VEGFR2. VEGF165 is the only splice variant that binds to co-receptors NRP-1 and NRP-2 that function to enhance VEGFR2 signaling. Binding of VEGF165 to VEGFR1 and VEGFR2 leads to activation of the PI3K/AKT, p38 MAPK, FAK and paxillin. VEGF plays a key role in tumor angiogenesis in many cancers.